Skin: Examine over the back for cutaneous stigmata of tethered spinal cord. Neurological examination: Routine findings are expected. Routine preoperative testing: Normal results are expected. Spinal anomalies on plain x-rays: Plain radiographs of the lumbosacral spine will illustrate potential bony malformations including spina bifida occulta. Ultrasound in neonate: In the neonate, ultrasound of the lumbosacral spine is often the reason for clinical referral to neurosurgery with some concern of tethering, e.g., thickened filum. Ultrasound plays no role in evaluation of the conus in the older infant. 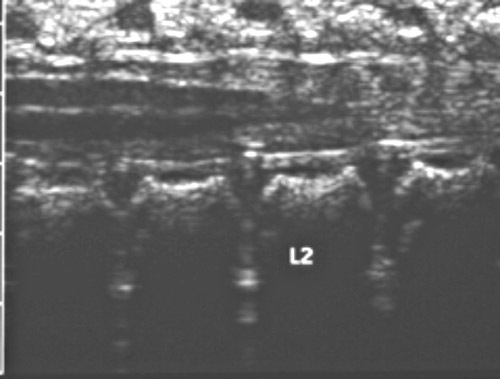 Ultrasound, sagittal view, of upper lumbar spine in a neonate: The ultrasound was performed to rule out tethered spinal cord. This patient’s conus terminates at a normal level. 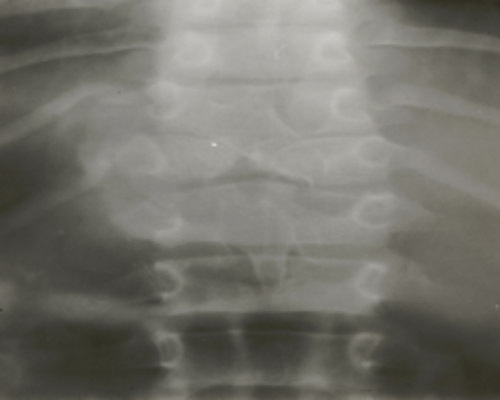 Plain AP radiograph of the thoracolumbar junction of spine: A malformed T12 vertebra is seen. CT for better bone imaging: CT of the lumbosacral spine may be considered if definition of the bony anatomy is greater than what plain radiographs show is necessary. However, CT is not the primary test to be considered for this entity. Lumbar spine radiographs and lumbosacral spinal MRI. Using these studies, the authors identified several spinal anomalies in their patient population (35-37). Ten of the 13 had bony abnormalities, including scoliosis (three patients), bifid vertebrae (ten patients), hemivertebrae, and segmentation errors. Nonbony dysraphic anomalies included meningocele manqué in two patients, intradural lipoma in four patients, split cord anomaly (without median septa) in two patients, and terminal syringomyelia in two patients. 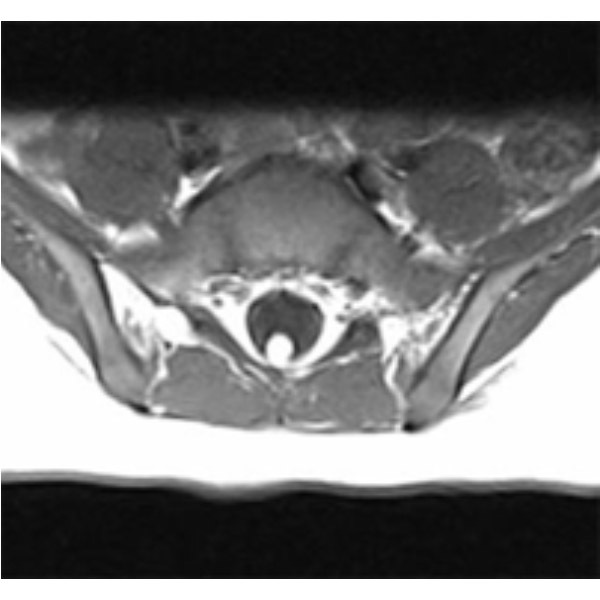 Axial T1-weighted MRI of the cauda equina: Shown is a filum infiltrated with a lipoma in a patient with a normally positioned conus. 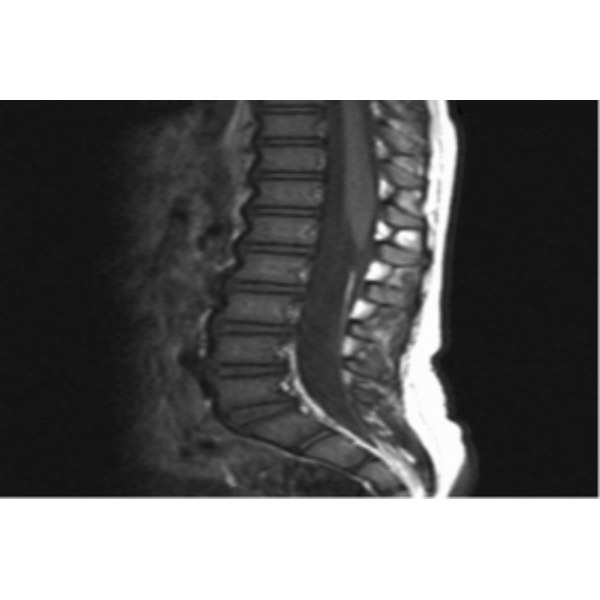 Entire spine should be imaged: An important caveat is that some of the individuals diagnosed with TCS with a normally positioned conus may have additional lumbar vertebrae, which would potentially distort the diagnosis depending whether the vertebrae are counted from a cephalad to caudal direction. In a review of 1,614 lumbosacral spine radiographs, the incidence of transitional vertebrae was found to be 8% (38). However, care should be taken to image the entire lumbosacral region as well as part of the thoracic region for improved accuracy. 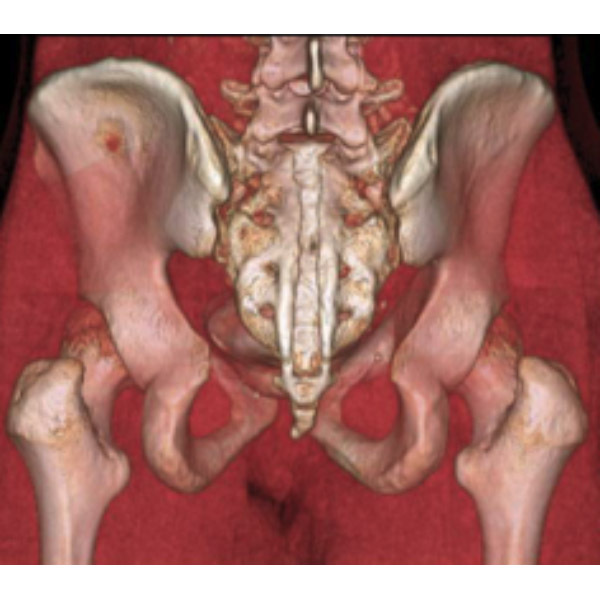 Impact of positioning for imaging on level of conus: It is important to note that most imaging is done in the neutral position and that the position of the conus may well change in flexion and extension. Even Barson (1), in his historic publication, stated “Our data represent the vertebral segments as though they were of constantly equal length both in respect of position and time. This is obviously not so, although no adequate physical measurements exist of the precise size of the various vertebral segments at varying gestational ages and the normal ranges to be expected.” Barson (1) also made an important query with regard to conus position by asking whether conus level is a result of an unusually short vertebral column or an abnormally long spinal cord, or whether both factors play a part. Urological testing and imaging: Urological testing provides a baseline that can be compared to after surgery, and imaging (MRI) reveals other intraspinal pathologies or anatomic variations (e.g., tethering bands, spina bifida occulta). If the results of urological testing are abnormal, then the decision for surgery is easy. If the results are equivocal but the patient has other related findings of spinal dysraphism (e.g., cutaneous stigmata, anorectal atresia, caudal agenesis), then the decision for surgery is also reasonable. If there is fat within the filum and any symptom that could be attributed to caudal tension on the cord, then again, surgery is reasonable. However, if normal results are obtained from imaging (cord in normal position and no fat in the filum) and urological testing, and symptoms are vague or could only remotely be related to caudal tension on the cord. then surgery is less likely to have any effect, and other causes for the patient’s symptoms should be investigated.